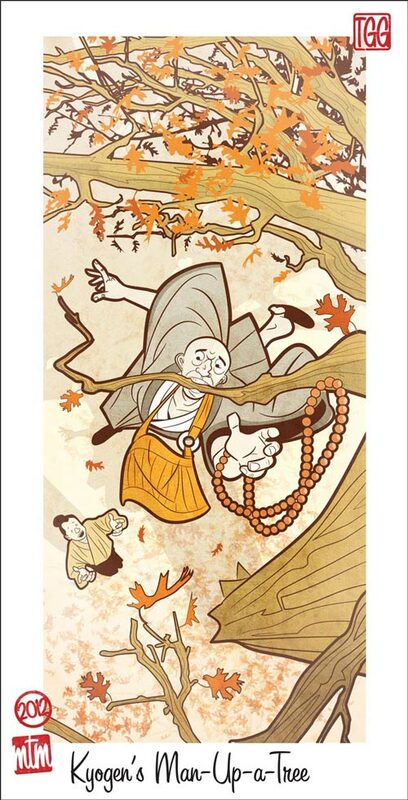 Master Xiangyan said, "It's like a man up the tree, hanging from a branch by his mouth; his hands cannot grasp a branch, his feet won't reach a bough. At such a time, how should he respond?" The version in Dogen's 300 adds that the tree overhangs a one-thousand-foot cliff. A monk asked Xiangyan, "Without using either relative or absolute terms, please tell me why Bohdhidharma came to China from India." Xiangyan answered, "You are hanging from a tree by your teeth over a precipice, and your hands grasp no branch and your feet rest on no limb, and you must answer the question. If you do not answer, you are a dismal student of Zen, but if you answer, you fall from the tree and lose your life." Then Senior Monastic Hutou came out and said, "Master, let's not talk about being in a tree. But tell me, what happens before climbing the tree?" The ancestors all had a way of creating complications where there are none. This may be an old question, but it still needs to be addressed by each generation. You and the questioner hang from the same tree. Xiangyan makes sure this is indeed a question of life and death. 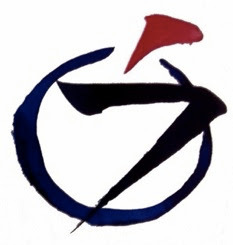 If you truly wish to understand the teaching of the Zen school, you need to see into it here. He wants to change the subject. No. He is not changing the subject, just the hand that holds the sword. This amounts to something. He can let go, he can gather in. It is easy to say it up on the tree. To say it under the tree is difficult. So I shall climb the tree myself. Come, ask me a question!" Even if your eloquence flows like a river, it is of no use. Even if you can expound he whole body of the sutras, it is of no avail. If you can respond to it fittingly, you will give life to those who have been dead, and put to death those who have been alive. If, however, you are unable to do this, wait for Maitreya to come and ask him. Making his whole body into the glaring eyes of a demon. Or "...is just blabbing nonsense" (Aitken); "...is truly inept" (Cleary); "...really has bad taste" (Low); "...is truly thoughtless" (Sekida); "...is truly a fool" (Senzaki); "...is just gibbering" (Shibayama). Or "his poisonous intentions are limitless" (Aitken); "Spreading his ego-killing poison" (Senzaki); "How vicious his poison is!" (Shibayama). Or "making his whole body a demon eye" (Aitken); "So demon eyes squirt out from all over their bodies" (Cleary); "Frantically they squeeze tears out from their dead eyes" (Low); "And devil's eyes sprout from their bodies" (Sekida); "And causes tears to stream from their dead eyes" (Senzaki); "He makes their devil's eyes glare!" (Shibayama). Dahui Zonggao asked Dongshan Huikong, "What is the meaning of Xiangyan's 'Up a Tree'?" Dongshan replied, "Let's sing 'Partridge' to the spring breeze!" When Xiangyan was studying under Guishan, Guishan asked him, "Let me have your view as to your own being before your parents were born." Xiangyan couldn't respond. He retired to his room and looked through all his notes of Baizhang's teishos, but he could not find anything suitable. Returning to Guishan he said, "I have failed to find a response to your question. Please teach me the essential point." Guishan said, "I really have nothing to teach you. And if I tried to express something, later you would revile me. Besides, whatever understanding I have is my own and will never by yours." Xiangyan thereupon burned his notes and determined that he would be just "a rice-gruel monk" and face Guishan's profound question moment by moment, rather than trying to resolve it by means of intellectual research. Hearing that the tomb of National Teacher Nanyang Huizhong (675?-775) was being neglected, he asked Guishan's permission to go there and serve as caretaker. Guishan approved, so Xiangyan built a small hut near the tomb and spent his days cleaning the grounds, absorbed in his koan. 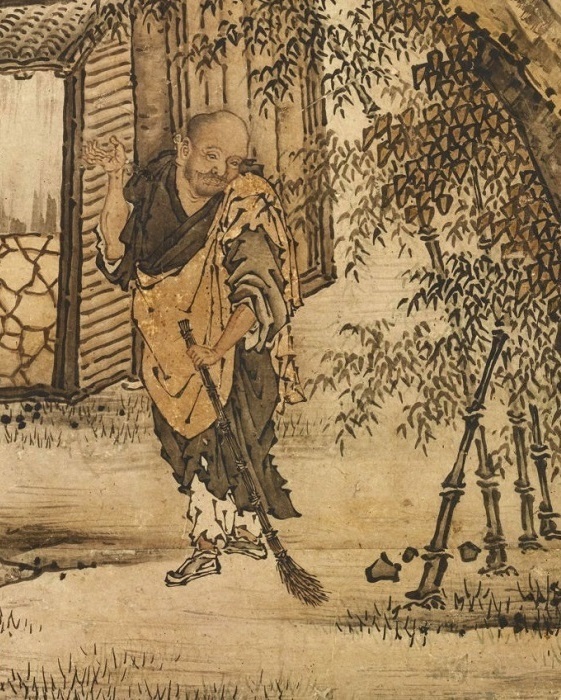 One day while sweeping up fallen leaves, his bamboo broom caught a stone, and it sailed through the air and hit a stalk of bamboo with a little sound Tock! With that tock! he was awakened. One tock! has made me forget all my previous knowledge. No artificial discipline is needed at all. and never fall into the rut of mere quietism. and my senses are not fettered by rules of conduct. all declare it to be of the highest order. this year it is the real thing. this year even the gimlet is gone. it can be seen in a solitary twinkle. call the acolyte and ask him about it. Thereafter Xiangyan resumed monastery life, but as an independent teacher. Xiangyan echoes the Buddha's First Noble Truth, duhkha, the dissatisfaction one feels about the circumstances of life. The most difficult of these circumstances are evanescence and interdependence. Everything passes away, and everything depends upon everything else. Permanence and independence are simply not possible, any more than release from the tree is possible. But duhkha itself can be melted, as the Buddha said, and this is Xiangyan's purpose. We should be able to identify with this person up the tree. There we are, hanging by our mouth, with nothing to secure ourselves. Just at that moment, someone comes and asks for help. They have a need that is great, and only we can respond. If we do, we sacrifice ourselves and fall to our death. If we don’t answer, we put our own interests before another. What are we to do? We vow to save all sentient beings, to alleviate their suffering and help bring them to awakening, and to do this for ourselves as well. You go in in the evening to sit, hungry to do some zazen, and your child needs some help with their homework. Your best friend, you find out, is unfaithful to their partner who is also your friend. Somebody at work is lying, cheating, or stealing. What do we do? Realizing oneself and alleviating the suffering of others are not two different things. Realizing wisdom and manifesting compassion are not two different things. In healing others, we heal ourselves, in realizing ourselves we realize others. That is why when the Buddha experienced enlightenment he said, “All sentient beings in this moment have attained the way.” When we realize our true nature, the inherent emptiness and interdependence of all things, we realize the cessation of suffering: that all beings are buddhas and that they depend on us. Because there is no longer any obstruction called the self, we are free to respond as Avalokiteshvara, the one who hears the cries of the world. When we offer ourselves to others without any self-consciousness, we manifest the life of a bodhisattva. In each moment you meet one dharma. In each moment you practice one dharma. Isn’t this the nature of our living and dying? So please take care of your practice, because what you do affects us all. Practice as though your life depends on it, because it does. Xiangyan made the whole earth into a glowing furnace, its fierce flames reaching through the sky: even iron and steel melt at once. He wants to lead his peers to the fundamental reality. Countless are those who have lost their lives. When the clouds have dispersed in the eternal sky, sun and moon are new. The man holding onto a tree branch with his teeth symbolizes the attachment of a conditioned mind to the fragment of reality perceptible through the worldview to which the mind is habituated by personal and cultural history. Enlightenment requires standing apart from the mind-set to which one has been conditioned, yet without warping the mind's capacity for constructive organization. It is plausible to assume that a man who holds onto a tree with his teeth would fall away. Answering or not answering the question is not his most urgent problem. What he needs is not philosophy, but somebody who is kind and courageous enough to help him down. Commentaries by later masters are either: (1) criticisms of the koan or of the personalities appearing in the koan; (2) attempts to clarify the koan's meaning; or (3) in some cases simply implications of the mood of the later masters in relation to the koan. Xuedou's quasi-paradoxical comment implies that the concrete problem of being caught up in a tree (i.e., being in danger) is not to be confused with abstract speculations about "the meaning fo the founder of Zen (Bodhidharma) coming to China" (i.e., the meaning of Zen) Answer #1 (for Xuedou's "on the tree"): The pupil stands up and takes the pose of hanging down from a tree. With certain masters, there are pupils who may stick a finger in the mouth; utter "Uh...uh"; and, shaking the body slightly, give the pretense of one trying to answer but unable to. Answer #2 (for Xuedou's "under the tree"): The pupil pretends to fall from a tree. Landing on his bottom, he says, "Ouch! That hurt!" Old master Xiangyan's words are clearly lethal. The only path through this dualistic dilemma is to die the great death and realize real freedom. How is this accomplished? We should appreciate the fact that the questioner, in asking about the Ancestor's coming from India, is also "hanging from a tree on a one-thousand-foot cliff." If you can answer Xiangyan, you will free not only yourself but the questioner as well. Dogen says, "If we look at this koan with a 'nonthinking mind,' we can attain the same real, free samadhi as Xiangyan and grasp its meaning even before he has opened his mouth." What is this "nonthinking mind"? Setting aside Xiangyan, the tree, and the cliff, you tell me, what is the meaning of the Ancestor's coming from India? If you open your mouth to answer, you have missed it. If you don't open your mouth, you are a thousand miles from the truth. Senior Monastic Hutou makes it clear. In the tree, below the tree, before the tree, after the tree -- it's all dirt from the same hole. Xiangyan in this koan exactly expresses the dilemma: if I say what it is, then that is not it. If he doesn't answer, he evades his duty. If he answers, he will lose his life. It is like a Zen master cautioned, "If you advance one step, you lose sight of the principle. If you retreat one step you fail to keep abreast of things. If you neither advance nor retreat you would be as insensible as stone." So how does one avoid being insensible? "Advance one step and at the same time retreat one step." Xiangyan was faced, as we all are, with the ultimate dilemma: I know and I must speak, but if I speak I lose what I know and so therefore cannot say it. Xiangyan is driving you here into the same predicament he found himself in with Guishan. Guishan deprived Xiangyan of all his clever learning by asking he question, "What is your real self -- the self that existed before you came out of your mother's womb?" -- before you had learned anything at all. Xiangyan's books gave him no answer -- he had no foothold or handhold. If he can make a no-answer with a truly empty mind, then even if he cannot utter a word he is making a great answer. However eloquently he speaks, without an empty mind he is a dead man. Once lose your life as Xiangyan did. Let go the branch, and a whole new life opens up before you. Xiangyan here is not giving his opinion about Zen. If he were, he would have to use a relative term. He is not pointing at Zen through postulation. If he were, he would have to use an absolute term. He addresses through his question the very being of the monk, the questioner himself. Why does the monk have to worry about Bodhidharma? It does not matter whether Bodhidharma came from the West to the East, or from the East to the West. The concern of the moment is to see his own true self the moment he acts. Xiangyan wanted to teach the monk the thrift of Zen, and thus he stopped the use of his hands and feet; he required the monk to be enlightened before he opened his mouth and fell from the tree into the precipice. It is the same trick as cutting off the finger of the imitator in GG3. The kindness of such an unkind action is to block off the road of thinking. Zen never says, "Try this method, and then you will be enlightened." It only demands that action which is enlightenment itself. Truly, a life controlled by its dualistic intellect may be likened to the man in this strange koan. How can he break through the barrier of this great dilemma? Unless one faces the inescapable crisis and has once had the experience of dying, one will not have true freedom. Xiangyan says in the koan "at such a time." This means "just as he is," with no thought working, no consciousness moving. 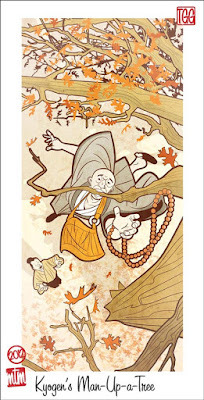 If he hangs from a tree, just as he is hanging, the essence of Zen is alive and manifest there. If one has fallen from the tree, just as he has fallen, the essence of Zen should be alive and manifest there. Here and now, just as it is -- this is "it." What other answer can be possible? What is essential in Zen is "to cast away one's discriminating mind." When this is done, for the first time one can transcend yes and no, good and evil, and can declare that everything, everywhere is "it." One can then truly grasp Xiangyan's Zen. Koans bring us to a land abounding in contradictions of ideas and concepts. Thee is no other way of freeing ourselves from this confusion than by cutting through it as though it were the Gordian knot. This cannot be done by rational thinking or logical reasoning. It can only be accomplished factually. What is a fact in Zen? It is the manifestation of essential nature by an action such as standing up, sitting own, eating, drinking, crying, or laughing. In the case of Zhaozhou's Mu (GG1), Mu is the fact. In the case of Jinhua's finger (GG3), raising a finger is the fact. In this case, the fact is some action of the man in the tree. there it is, alone and revealed. the blue mountains have not a speck of dust. It's a classmate copying your answers. It's how time and being are each other. It's the craving of craving. It's a question about meaning. It's the taste of bark.